Lewis Hamilton drives in Malta. 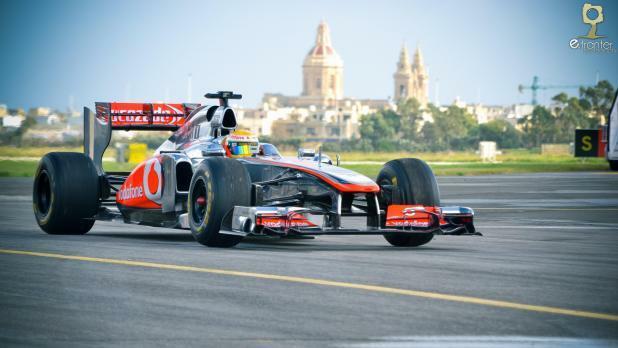 Four times formula one champion Lewis Hamilton, as far as is known, has only visited Malta once. He was here for a few hours on a cold Sunday morning on December 9, 2012 when he drove a McLaren formula one car for the last time before switching to Mercedes, roaring down the airport's secondary runway for Paqpaqli ghal l-Istrina. But the newly released Parardise Papers, the latest tranche of secret documents detailing where the rich and famous stash their cash, has revealed another link between the Briton and Malta. The documents allege that Hamilton used offshore entities to shelter himself from the payment of a hefty tax bill estimated at £3.27 million associated with the purchase of his private jet, a Bombardier CL605 Challenger. He acquired the aircraft in 2013 through a series of companies domiciled in the British Virgin Islands, Guernsey and the Isle of Man. According to The Guardian, in March 2015 he incorporated 44IP, named after his racing number, in Malta. The company’s stated purpose was to hold “image rights … trademarks, royalties, copyrights”. Its shares were held by Inday Rose Ltd, the British Virgin Island company that also ultimately owns his jet, and BRV. As well as renting the jet, BRV holds Hamilton’s contract with current employers Mercedes. "The purpose of 44IP appears to be to channel income from sponsorship deals via Malta, which charges foreign shareholders a 5% corporation tax rate," the newspaper said. Hamilton left the UK as soon as he became a successful F1 driver, setting up residence in Monaco and Switzerland. The UK's Sunday Times has estimated his wealth at £131 million. The leaked data was obtained by German newspaper Süddeutsche Zeitung and shared with the International Consortium of Investigative Journalists and a network of more than 380 journalists in 67 countries.